Robert: Welcome to the Ecommerce Marketing Podcast. Today’s guest is Heather Lloyd-Martin. She is the CEO of http://seocopywriting.com. Heather has worked with top companies all around the world, from search engines and television networks to Fortune 500 companies and major publishers. Over the years, she has presented at hundreds of conferences, including SMX, Popcorn, Searchfest, Search Engine Strategies, MarketingProfs and many more. Heather loves helping clients unlock their search positions, and boost their conversions. 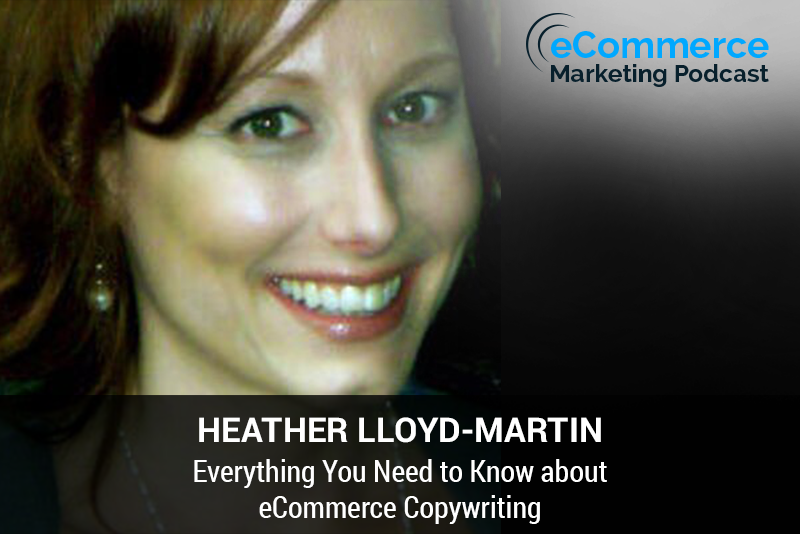 Welcome to the Ecommerce Marketing Podcast, Heather. How are you doing? Heather: I’m doing well. Thank you so much for inviting me. Robert: Yes, so if you can just tell us a little bit about http://seocopywriting.com and what you guys do, what type of services you provide? Heather: Oh, sure. Thank you. So, SuccessWorks that you can find on http://seocopywriting.com where we specialize, is on SEO content development and training. So for the companies that want to write better copy that clicks with their readers, gets better rankings and makes them more money, a lot of times they come to me to help them write the copy, or to train their team so everyone’s on the same page of how to create that really great content that gets the conversions, gets social shares, and does everything that we want the content to do. Robert: So what type of conversions do people see once they start making the changes with their copy, and following all the suggestions you gave them? Heather: That’s a good question. For a lot of companies, when they learn how to do everything right, it helps to unlock their search ranking. So they might have been confused about why they weren’t positioning before, and it tends to be something internal. They were told to do things a certain way, and they didn’t realize that they had to do key phrase research, for example, or they didn’t know how to do the key phrase research in the correct way. So everyone talks about Google rankings kind of being the holy grail of what they want, and certainly that’s important—to have that content rise to the top and get that visibility on the search results page—but what’s more important for folks, especially in the ecommerce world, is conversions. In terms of people making more money, the more traffic coming to their site in terms of qualified traffic, and then folks taking action on their site, figuring that when they’ve landed on that website that seems to understand them, then they don’t have to go looking for other sources to buy what they want; they’ll purchase from your site instead. So, certainly it’s a case of, yes, the Google rankings are important, but at the end of day, are your visitors taking action? Are they buying from you? Are they maybe buying more from you? Are they signing up for your newsletter, and thus having a higher lifetime value than perhaps what they had before? So there’s a lot of elements that go into this, and it all goes back to the traditional direct response copywriting of trying to write copy that clicks with that reader and makes them excited to take action. Not just that they will, but they’re excited to, because they feel that that website is the source for what they want. Robert: Yeah, you brought up ecommerce businesses, and copywriting sometimes can be challenging for them depending on what products they’re selling or how they’re trying to position themselves, but you have shown that it is important for ecommerce businesses to have great copy and to do great copy for their businesses. So how do they get started, or what do they need to be thinking about once they see that it’s important to have great copy for their businesses? What are the steps they need to take? Like I said, it can be challenging for some of these businesses to find how they’re going to do copy for their website. In some cases that might be kind of sort of true, but certainly if you’re working with a very competitive product base where you’ve got a lot of other people online selling what you sell, and if you are somebody who wants to control everything in terms of everything you can do to make that page a success, then writing naturally is a really dangerous thing to do. So you want to have these SEO elements in play while you’re writing the content, and there’s other things of course that your readers or your listeners know about—things to think about in terms of ecommerce sites or SEO in general. So the first thing to think about is to really know your audience. Who is your target reader? Who is the person that is coming to the site? What does she want to see? What’s important to her? What are her main hopes and fears and desires? What people forget—and it’s really easy to forget—is that people buy on emotion. Your readers buy on emotion. So for example, you might charge five dollars more for a product than most of your competitors, and if people feel like they can trust your website more, that you get them, that you can connect with them, that that copy brings up those fears and then overcomes those fears, that they will be happy spending the extra money, because they feel that you’re a more trusted resource. We see this all the time all the time in our own behavior of, yes we all want to get the best deal, but there’s some times that we choose to pay more, figuring that we’re getting a better value. So knowing your audience is incredibly important, and this is something that would ideally happen prior to the launch, but if you feel like “Oh, this is a step that we’ve skipped, and we kind of sort of know who our audience is, but we’re not really honed into how they tick” then I would recommend backtracking and really diving into who your audience is, and coming up with that customer person. The second thing I would recommend for the ecommerce companies is to look at what your main competitors are doing, and then do something different especially with ecommerce, especially when you are selling similar products as others, and this is for B2C, and well as maybe high-end B2B—where you might not have that many competitors, but certainly, one sale can mean tens of thousands of dollars to your company—to think about that brand voice of what kind of information do you want to have out there, and how do you want to say it. That ties back into the customer persona. The more you know about who you’re writing for, the better you can target your copy, and if you don’t have an idea and you’re kind of generally writing for everyone, your copy isn’t going to stand out. It’s going to sound the same as everyone else. So this is an opportunity for you to still provide the same great information, but to do it slightly differently, and if you’re working with say, B2C—which can be really competitive—and you’re looking for ways to stand out, this is a great way to do so—is to make sure that you sound a little bit different. Robert: Okay, so just actually to go back, you mentioned the customer persona, knowing your audience—your target audience—so what are some good ways for ecommerce businesses to land that? Is it just by calling them, talking to them, having them fill out surveys? Heather: Alright. I would recommend that you actually talk to them, and learn everything that you can about them. People will do that with customer service groups If they’ve been entrenched in the business enough, they might know some of the common characteristics of what’s going on with their target audience, and they can list that out. But when you get into surveys or doing things that are somewhat more impersonal, it takes you that step away from the process, and some of the best brainstorms that people will have when they’re doing their customer personas, is when they’re talking to maybe five, ten, twenty people, and listening to what they say, and sometimes, more importantly, what they don’t say about what they’re dealing with and what they’re concerned about. Maybe like on a B2B type of play, these people are concerned that whatever they purchase, they need to make sure that it’s up a hundred percent of the time, or ninety-nine percent of the time, because any kind of machinery downtime can cost their company thousands of dollars. So knowing what those fears are, and then being able to list them out, and figuring out how you would overcome them within the copy, is really important. So the more information that you know about those folks coming to the door, the more you can specifically write your copy to that one person, which, it kind of turns into that one person, and that copy is highly specific to what they are looking for, and tends to connect better with them than that general copy that you’re trying to hit all the paying points for everyone that might be coming in the door. Robert: Okay, and once you’ve learned everything you need to know about your customer, your target audience, and you have positioned yourself differently from your competitors after looking at your competitors, are there some other tips you have for ecommerce businesses and copy, or are those two major points and strategies enough for getting the types of conversions and results you want for your clients and the businesses? Heather: That’s sort of the starting part, and that’s the marketing part of it prior to the SEO part. Certainly, once you have a really good idea of the target audience, and you know that you want to write a page on x, you go through and you would do that key phrase research, and if your company is not savvy on that, or you don’t know how to do it, you don’t have anyone that you can work with internally, I’d recommend, if you were going to hire out, that would be an opportunity to hire someone to teach you how to do it, or to do it for you on a constant basis. So everything is tying in those words that your target audience already uses, and then it’s a case of writing great emotional copy, and one of the challenges of the online environment is, I think people have gotten far, far away from traditional copywriting standards and formulas, and these things still work online, of how you present the problem, and then you agitate a little bit and provide a solution. So even if it’s minor descriptive copy about a widget or something else, there are always ways to approach the copy to where you are hitting those emotional pinpoints, and making it an easier sale for yourself and for your reader. So certainly, if you’re selling a low ticket item, you might approach it very differently, but if you’re selling a high ticket item, that’s where you really have to make sure that everything is tight and wired, because if you don’t make that sale, that could be, again, thousands of dollars into your company, then you’re handing that off to your competitor, and nobody wants to do that. Finally, once that copy is set, you test and you measure it. Once you’ve added in all the other SEO elements of a great title, how you’re structuring your key phrases, writing it in a really natural and persuasive way, you want to see if it works. Are people buying more from the page? Are they converting the way that you want? And if not, that’s an opportunity to go back, make some tweaks, and see if that changes anything, and if there’s improvement there, then you can go with that. Robert: Okay, and once you have all of this going, you already know your target audience, you’ve checked your competitors, you did the keyword research, you’re doing the testing, are there things you need to be avoiding? Heather: Well, certainly. I talked a little bit about the myth of writing naturally and figuring that Google will automatically know what it’s about, so you want to stay away from that. You want to avoid adding in the key phrases so many times that it ruins your content. Some companies believe that this is the way you do it: you have a key phrase of “cashmere sweater,” and you hammer that key phrase multiple times within the copy, figuring that that’s what going to get Google to realize what the page is about, and the reality is, it doesn’t work that way. If anything, Google does not like those kinds of pages anymore. So how you write that content in terms of adding that key phrase in so it flows, and adding synonyms in where they’re appropriate, that goes a long way into helping Google understand this is quality content, but also for your readers, that they have a good reading experience when they come to the site, and the copy doesn’t sound like ‘our cashmere sweaters are the best sweaters online, visit our cashmere sweater gallery,’ which you still unfortunately see out there. Finally, the biggest mistake I’ll see—and I understand completely why people do this, because it’s easy—is they just flat out republish whatever the manufacturer description is, and say “This is our content.” That frightens me, because on one hand, it’s not going to position, because there’s a gazillion other sites out there that have that same content, and from that reader/user standpoint, it’s not anything that’s targeted to the folks coming to your site. So writing different content, and using maybe the manufacturer content as a base idea of how to approach things, but doing it in your own way and adding your own twist depending on your target audience, that’s really when you’re going to see great results. Robert: Okay, one thing I wasn’t expecting for our talk today—I didn’t even have in mind—was emotion, and it’s surprising that you bring in emotion with copywriting. It’s something that people don’t think about when they’re doing copywriting. Everybody’s has all this press to sell their product “Everything’s great, we’re the best,” but it’s interesting that you bring up emotion, and I didn’t know that emotion plays a big part in copywriting, or even SEO, even just for online. Heather: It’s huge, and it always has been. I’m actually doing a presentation for a client in a few weeks that’s talking about sales training, and what we know is, there’s a lot that goes into—when we’re looking at content—that emotional process that will give us either a happy signal to move forward, or a crunchy signal that say “No, we need to go and find another site.” A lot of this ties into how we connect with that copy, and feel like “Oh, this company understands my needs.” A lot of it boils down to traditional storytelling, of how you’re telling the story throughout the copy which, isn’t such a huge thing for product pages, but there are other opportunities on blog posts, and about pages, a little bit on product pages, to be able to tell the story about what you’re selling, depending on what you’re writing about. Also, we know from neuromarketing that there are certain things that we can do as writers, that will actually help our readers’ brains light up in a certain way, and that certain way makes it more possible for them to hit that buy button, and to feel more comfortable. So everything really ties down to—even what you would see as the biggest non-emotional kind of purchase of “I am buying an industrial blender, I am going to a B2B catalogue site to buy an industrial blender,” you would think that there is no emotional component to that whatsoever, but there are a lot of things beneath the surface that is going on in someone’s head prior to them clicking that buy button, even if it’s split second stuff. So the more that you can address that stuff in the copy and overcome objections, especially if you’re talking about high ticket items on your site, then the more chances you’re going to have to actually make that conversion. Robert: Yeah, that’s very interesting. You also mentioned copywriting standards. Is there a website or resource that people can look at when they’re doing their copy that will show them some of these tricks, or a template, or some of the standards you mentioned? It sounds like there has to be a resource out there that people can look at when they’re doing their copy. Heather: You can Google something like copywriting formulas, and we’ve all heard of the AIDA: attention, interest, desire, action. There’s PAS, which is Dan Kennedy’s. There’s a lot of different little formulas out there that have been tried and tested in terms of how to write the copy, what to have as an email subject line, how to create bullet points, which some copywriters call fascination points, so everything that you can possibly think of to write, somebody has broken down into a sales writing formula that you can try with your own writing. Certainly, there might be some formulas that are more appropriate that others depending on what you’re writing, but it shows that there is that template there, and a lot of ecommerce sites don’t really leverage that, because the writers that they have don’t necessarily come from a copywriting background. It doesn’t mean that they’re not good writers, but if say, your engineers are writing your ecommerce copy, they’re going to look at the copy in terms of what the features are, not necessarily what the benefits are that really click with that reader and helps them understand how a product can really help them. Robert: Okay. Are there some tools that people need to be using for copywriting? Heather: In terms of the active copywriting, not really. If you’ve got Word and you can type, you’re good for writing. In terms of the tools that you can use for SEO that can help you, there’s always Google’s research keyword planner that is free to use if you’ve got AdWords. That is kind of your basic key phrase research tool. Certainly, if you have a larger site, especially if you’ve got competitors and you’re trying to track what your competitors are doing, there is something called SEMrush. It provides key phrase research, but it also provides a lot of competitive intelligence data that is really cool when you’re trying to figure out why a site is positioning over yours, or things that aren’t right with your site, that you can run a report, and it will flag those things and what to fix. Heather: Finally, what I was going to talk about is a site called BuzzSumo, that if you’re writing blog posts and you’re trying to capitalize on what trends are, and what things are really popular within a particular market, BuzzSumo has all those metrics. It’s a big old big data aggregator, and can show you and give you some idea of what’s popular, what’s hot, what things have gotten the most social shares, so you have an idea of how to approach that content. Robert: Yeah, one quick question with BuzzSumo is, if you use it and you see “Okay, this is something that got a lot of shares, this is a topic that got a lot of shares,” for some businesses, they might be concerned. “Maybe I don’t want to write the same topic.” Does it seem like it’s somewhat plagiarizing? I mean you will do your own different take or write your own stuff but… Does that make sense? Heather: It makes perfect sense, and it’s an excellent question. What will give you the most bang for the buck, is if you look at that kind of data and say “Our competitor wrote a pretty good article on x, and they answered these kinds of questions. Great. So we know the questions our target reader is going to ask. We have a different take on this, so how can we take our competitor’s article and rewrite it, and make it even better.” So you’re not plagiarizing them or taking content from what they’ve written and massaging it so it’s your own. You’re actually looking at it in terms of an idea of “Okay, this seemed to be a hit with the target audience,” and then you’re creating something brand new that you know is going to maybe answer different questions, or have a different slant, or you’re talking about a perspective that the original article didn’t discuss. So everything you write is, again, laser targeted for your audience, and really touches upon those things that they want to read, but it’s different, and you can find those opportunities really easily, especially when a lot of articles and blog posts are written kind of fast. They might answer two, three, four reader questions, but they won’t really go in depth, and if you can be that person that goes in depth on a particular topic, and answers those questions that people really want to know more about, then you will, in essence, probably win in terms of good positions, and also really great social shares if you have some sort of amplification campaign behind it. Robert: Okay, and last question, is there once thing that ecommerce businesses can do right now to improve their copy? Heather: The thing I would look at right now is, check out your analytics and see what people are doing, and use that as your first step. So if you have an important sales page on your site, and you’re finding that people are coming to that page and immediately backing out, and they’re not taking action, you know that there’s a huge opportunity there, and for a lot of sites, if they go through their analytics and check this stuff out, they’ll find that there’s a number of pages that aren’t clicking, and it could be that you’ve got someone in your company that would be able to look at those data, maybe pair with something, like through SEMrush, and get an idea of where to go next. It might be that that’s an opportunity where you look elsewhere for a consultant to come in and provide that data for you, but however you do it, the first step is to know what’s working and what’s not, and then after that, you can develop a plan of: do you need to change your titles? That can be huge for ecommerce companies. How do you change your content? Do you need to change your calls to action? But first, knowing what’s wrong will help you at least get an idea of what you have to do, and then from there, you can start building out a plan of how to make that happen. Through training, through writing, through changing processes—whatever has to happen within the company, you’ll have the order that you’ll need to move forward. Robert: Thanks for doing the podcast, Heather. How can people reach you? Through Twitter? Your website? Heather: Yes, so people can reach me on my website at http://seocopywriting.com“, reach me by sending an email to [email protected], or you can find me on Twitter, and my twitter handle is @heatherlloyd. Robert: Okay, and you also have a book out there. What’s the name of the book, in case people want to read your book, learn more about your process, etc.? Heather: What I have now, the book was so incredibly out of date that I let that go, was Successful Search Engine Copywriting. Now what I have is the SEO Copywriting Certification training, where I talk about the things that we’ve discussed here, and I break it down into step by steps. So for folks that are writing, whether they are freelance or they’re writing in-house, they have a template of how to go through these steps, how to do the key phrase research, and then if they choose, an opportunity to have somebody else go over that work and provide input on what they can do different, what’s really great and what can be tweaked. So folks can visit my site and learn more about the training, as well as sign up for my newsletter, where I provide other type of tips that I don’t include on my blog. Heather: Probably the final thought that I would have is that, if all of this was completely overwhelming to some of the readers because they realized “Wow, there’s more to this than I thought,” just relax, because a lot of this, although it sounds initially overwhelming, can be done in baby steps, and as long as you’re always doing a little bit of something and making progress on your campaign and on your copy, you’re going to be seeing that continual improvement. So don’t feel like you have to do everything tomorrow. You don’t. But certainly, having a plan in place and then getting everything together, that will benefit you, and you should see better search positions, but more importantly, better conversions from your efforts. Robert: Thanks for doing the podcast, Heather. Heather: Excellent. Thank you so much for inviting me.